White House Deputy Chief of Staff Karl Rove listens as President Bush makes remarks to the media in the Roosevelt Room of the White House. The White House inadvertently crashed the computers of Senate Judiciary Committee staffers Thursday night with another massive dump of e-mails about the firings of eight U.S. attorneys last year. In all some 2,400 pages of new documents were made available five days before Attorney General Alberto Gonzales appears in front of the Senate Judiciary Committee to give make-or-break testimony in the scandal. With their computers back up and running, Capitol Hill staffers are digging through the pile, looking for new avenues of investigation. But the White House will not exactly be unhappy if they unearth something, especially if it amounts to nothing more than new evidence that the White House used political considerations in picking which U.S. attorneys to fire. In the end, political consideration in the appointment of federal prosecutors is not only common, it's practically a Washington tradition. And though it would strengthen the Democrats' accusations of cronyism in the Bush Administration's handling of the Justice Department, any revelation short of evidence of actual obstruction of justice will be a welcome distraction from the new, much more troubling storyline that the U.S. attorney firings generated this week. Late Tuesday, the Bush Administration admitted that in reviewing documents requested by Democrats for their investigations, it discovered that as many as 50 of its staffers may have violated the Presidential Records Act. The staffers, the White House said, were using e-mail accounts, laptops and BlackBerries provided by the Republican National Committee for official executive branch communications rather than the exclusively political work for which they were intended. Because the RNC had a policy until 2004 of erasing all e-mails on its servers after 30 days, including those by White House staffers, and because some of those staffers may have deleted e-mails on their own, the White House said it could not assure Congress that they have not violated the PRA, which requires the retention of official White House documents. The White House officials who may have broken the law include senior adviser Karl Rove, his deputies and much of their staffs. The White House says it is trying to recover the e-mails. "Some official e-mails may have been potentially lost," says Scott Stanzel, a deputy White House spokesman, "We will do everything practical to retrieve them." Stanzel and other Administration officials, speaking on background, say the accounts were established in an attempt to stay on the right side of the Hatch Act, which requires rigorous separation of official government activity from overt political work, like fundraising. "[Some] White House staff members have duties that require them to interface regularly with political organizations," Stanzel says, and therefore they needed separate equipment to stay on the right side of the law. Members of the White House counsel's office met Tuesday with House Oversight Committee chairman Henry Waxman, who has spearheaded the e-mail investigation. Afterwards Waxman called the revelation that the e-mails might have been lost "a remarkable admission that raises serious legal and security issues," adding that, "The White House has an obligation to disclose all the information it has." Already, tension has built over this last question; the White House believes that even RNC-retained e-mails, if they were between two White House staffers, are privileged executive branch documents that should not be turned over to the Hill, while Democrats insist any document at the RNC is subject to a Congressional subpoena. The White House is hoping this new controversy  one potentially with real legal and not just political consequences  will fade fast. 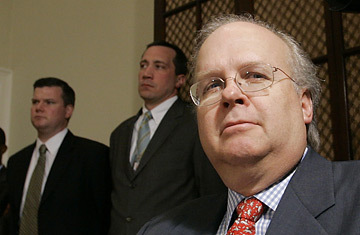 Rove's lawyer came out Friday to try and tamp the story down, saying that Rove thought his RNC account e-mails were being retained. "His understanding starting very, very early in the Administration was that those e-mails were being archived," the attorney, Robert Luskin, said. And already the White House's massive document dump is making useful headlines. So far the most intriguing revelation in the 2,400 pages is troubling but hardly criminal. In a spreadsheet analysis of the professional qualifications of all U.S. attorneys drawn up by DOJ staffers, there are sections for both prosecutorial and political experience. The latter category is broken down into columns showing time spent at the Justice Department, on the Hill, in political campaigns and government staff. The last column indicates whether or not the U.S. attorney is a member of the conservative legal organization the Federalist Society. It will be interesting to see just how exercised the Democrats and the media get over that revelation. It confirms the widespread impression in Washington that the Federalist society has become more important as a tool for career advancement among Republican lawyers than as a forum for discussing and strengthening the conservative legal agenda. And it is tangible proof that Gonzales' team was giving weight to political and ideological purity as they assessed which U.S. attorneys they planned to retain or fire. But it's a safe bet that even if Congress and the media are temporarily distracted by the current document dump and revelations like the Federalist Society rankings, the question of the lost e-mails will be front and center for much longer. Waxman is dogged, and shows no sign of backing off on the issue. More broadly, the U.S. attorney firings has shown that the Congressional Democrats know how to put the White House on the defensive. The lost e-mails allow Democrats to hint darkly of a cover-up even if nothing nefarious was lost, placing the Republicans in the uncomfortable position of having to prove a negative  that there was nothing important in e-mails they can't produce. Given the performance of Waxman and New York Senator Charles Schumer over the last three months, there's little reason to think they'll miss that opportunity.